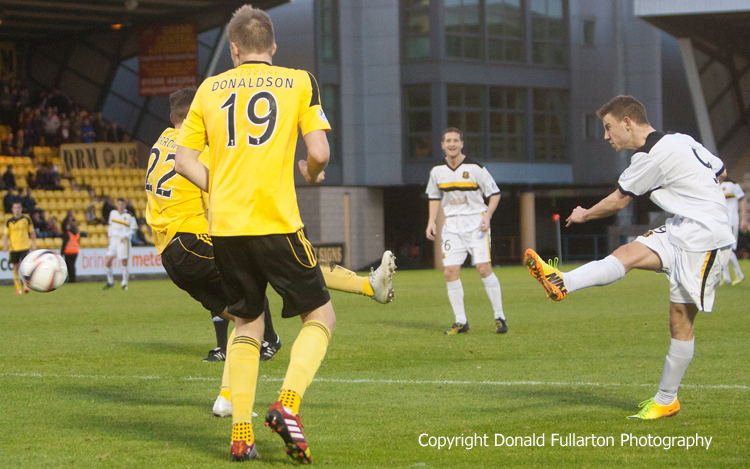 DUMBARTON pulled off an exciting and important victory over hosts Livingston at the Energy Assets Stadium. DUMBARTON pulled off an exciting and important victory over hosts Livingston at the Energy Assets Stadium in front of a crowd of just over 1,000. John McGlynn's men had the better of the first half, and ace striker Marc McNulty, who had already been booked for diving, put them in front with a brilliant 20 yard volley into the top corner which left keeper Jamie Ewings helpless. Dumbarton levelled before half time. Skipper Andy Graham won possession after a corner kick and passed back to striker Mitch Megginson, who blasted home another brilliant strike. Manager Ian Murray gave his players a roasting at the interval, and they came out for the second half transformed. They took command with a series of attacks before full back Paul McGinn was flattened in the penalty box. Chris Turner took the kick and placed it wide of the keeper. The home side tried to fight back and looked dangerous at times, but Sons continued to attack with pace and flair. It paid off when the outstanding Jordan Kirkpatrick played in Mark Gilhaney, who crossed for sub Bryan Prunty to net from six yards. The victory moved Sons up to sixth in the Championship, level with Alloa Athletic and three points ahead of Livi. The picture shows Mitch Megginson netting Sons opener.